As the arcing loops above an active region began to rotate into a nice profile view, NASA's Solar Dynamics Observatory captured the dynamic, magnetic struggles taking place below (July 6-8, 2010). Full Story. A powerfulNASA spacecraft has caught a cluster of glowing magnetic loops bursting from thesun while watching a particularly active solar hotspot. The newviews of the sun were recorded by NASA's Solar Dynamics Observatory (SDO) in theextreme ultraviolet range of the light spectrum over several days, beginningJuly 6. A video still of the arcing magnetic loops was recently released byNASA's Goddard Space Flight Center in Greenbelt, Md. The arcingsolar material is blazing-white at the sun's surface, then fades to dull, hot orangenear the apex. Smoky wisps blur the outlines of larger loops, while smaller onesappear to vanish among the bright, crowded others. The arcs arethe routes taken by solar particles following the whipping loops ever-changing magneticfield lines on the surfaceof the sun. 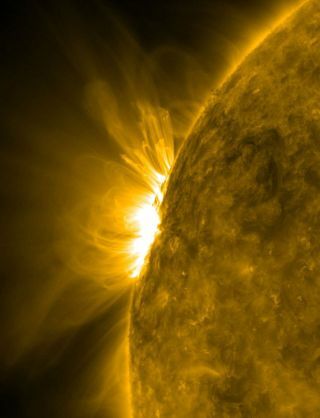 Small solar flares, hidden from SDO's view, also emerged fromthe sun in this area of intense activity. ? Launched inFebruary, NASA's SolarDynamics Observatory is flying on a planned five-year mission to study thesun in unprecedented detail. The spacecraft is equipped to recordhigh-definition views of active solar regions at a never-before-achievedresolutions. Solarstorms like those seen by SDO tend to follow an 11-year activity cycle andcan range from relative quiescence to fierce eruptions that can travel to all theEarth depending on their direction..
During theactive period of the cycle, solar weather monitoring is especially importantbecause it can pose a risk to satellites and astronauts in space.